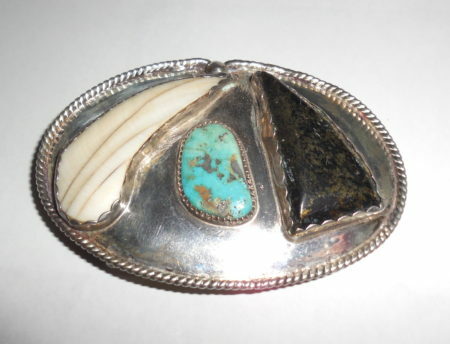 Native American Mens Belt Buckle Claw Apache Gold Stone Sterling Silver – This is a Southwestern vintage artist signed Native American solid sterling silver Apache Gold Stone and bear claw mens belt buckle. 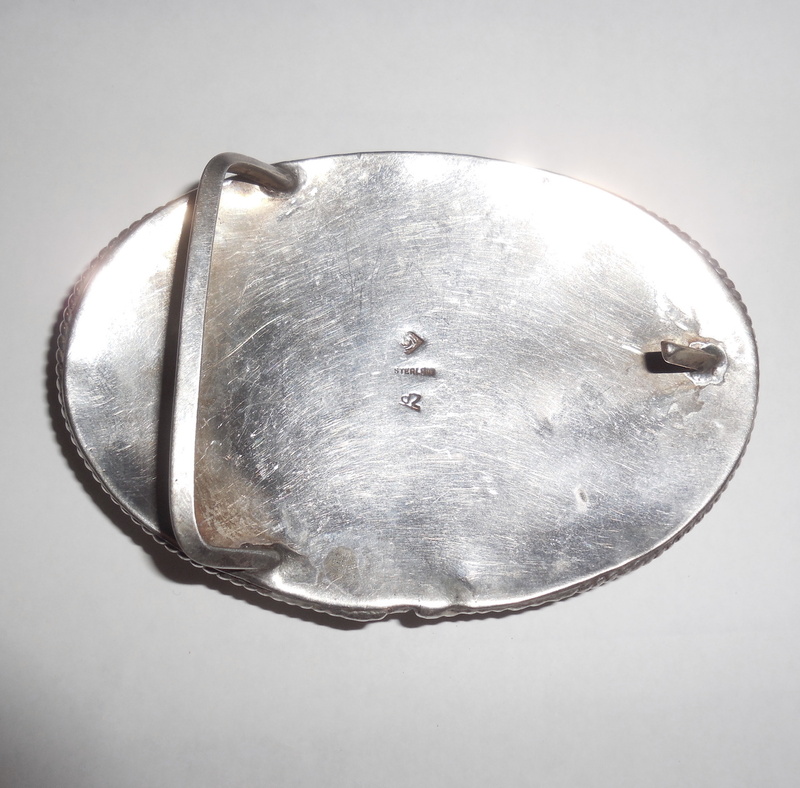 It is marked sterling with artist initials and Native American maker hallmark. 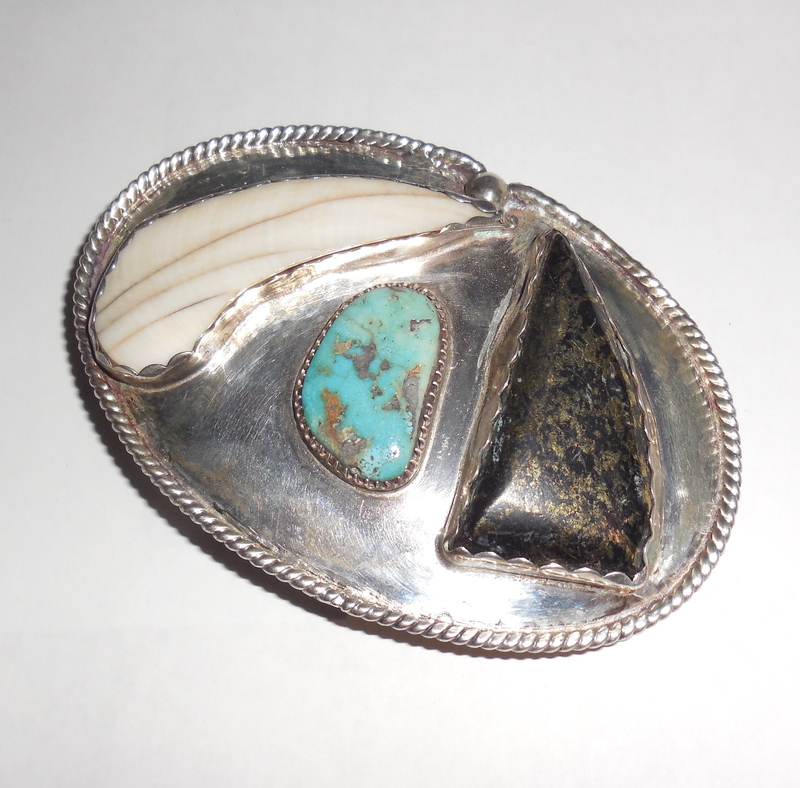 The center holds a well grained turquoise stone that measures 24mm north to south by 13mm across the center east to west. 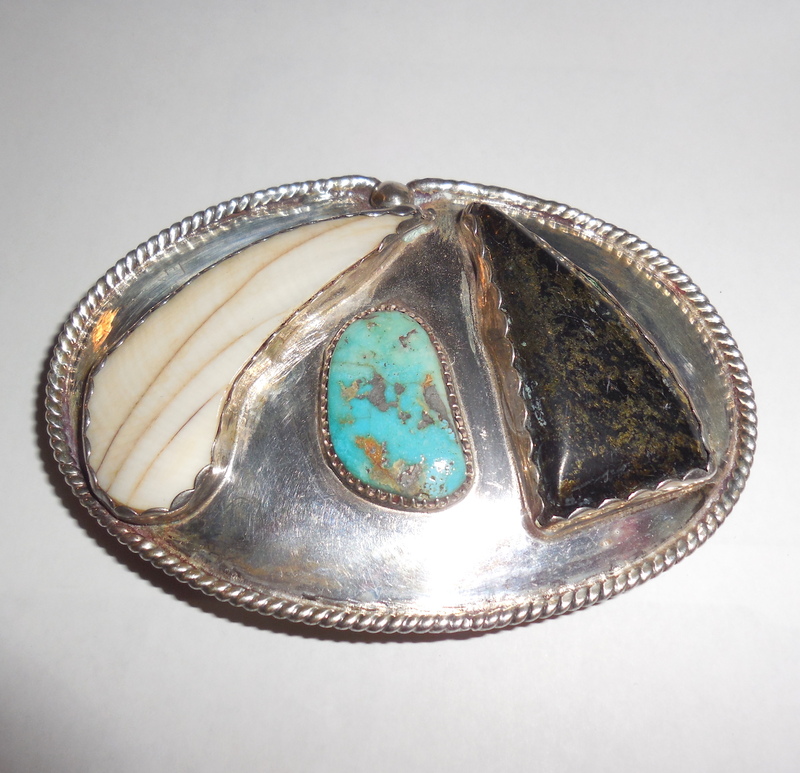 Flanking the center turquoise is a large 44mm by 18mm Arizona Apache Gold Stone on one side and a large natural 53mm by 16mm bear claw on the other side. 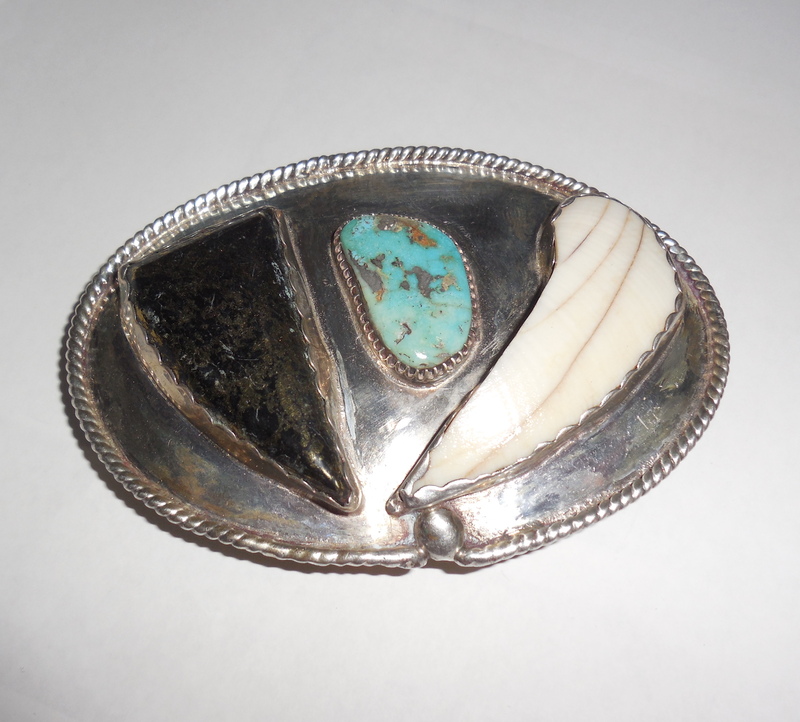 Size of buckle is 3.75″ inches east to west by 2.5″ north to south. Weight is 56.4 grams. 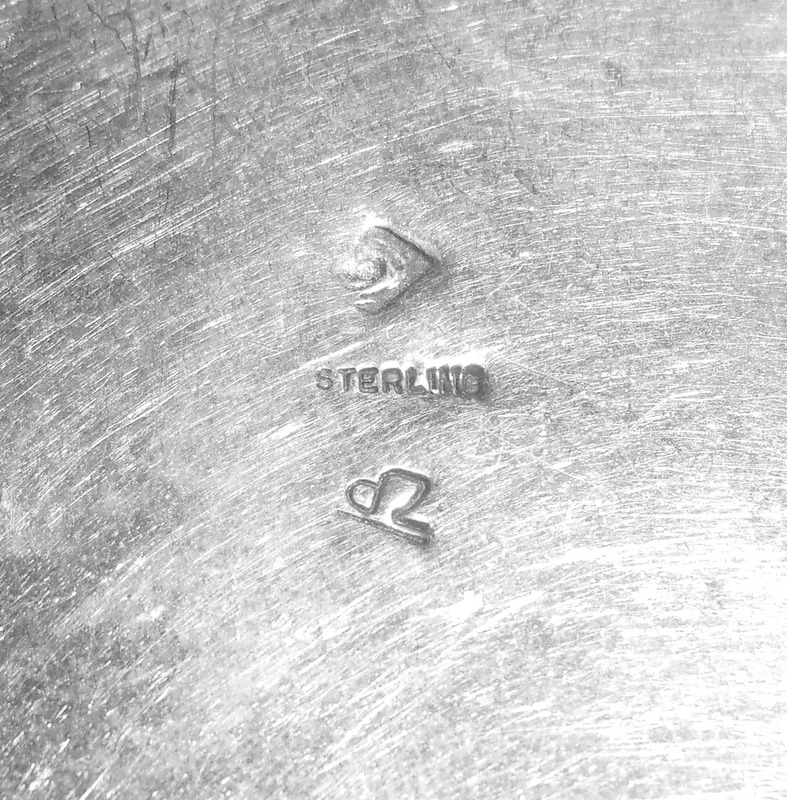 There is a photo of the maker/artist marking. 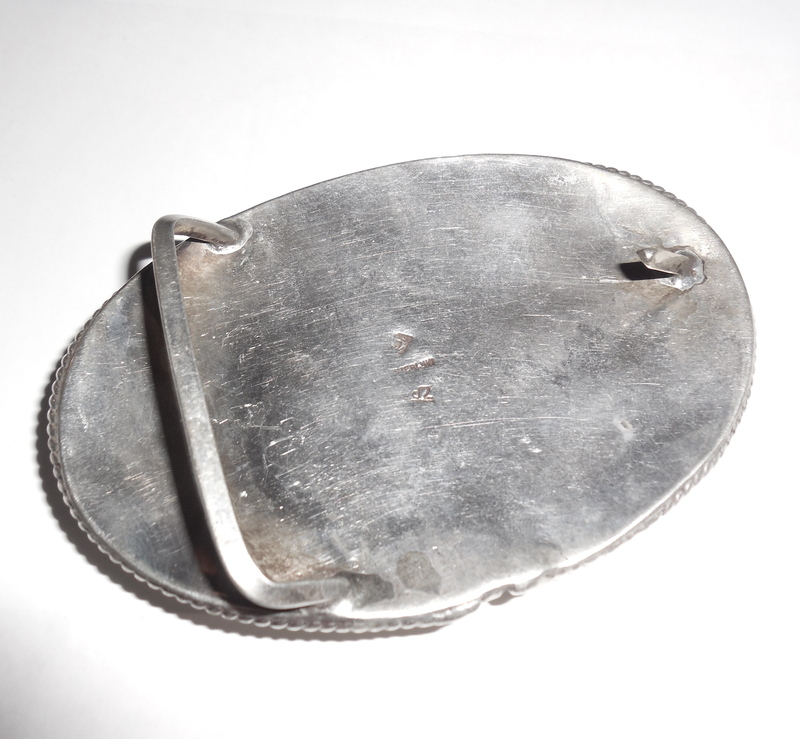 It is from an estate and has not been polished out. Overall condition is excellent, gently used. No dents or dings or deep scratches. Completely original. Never altered, repaired or modified in any way. Strong and very well made this is a lovely addition for your antique and vintage Native American collection. 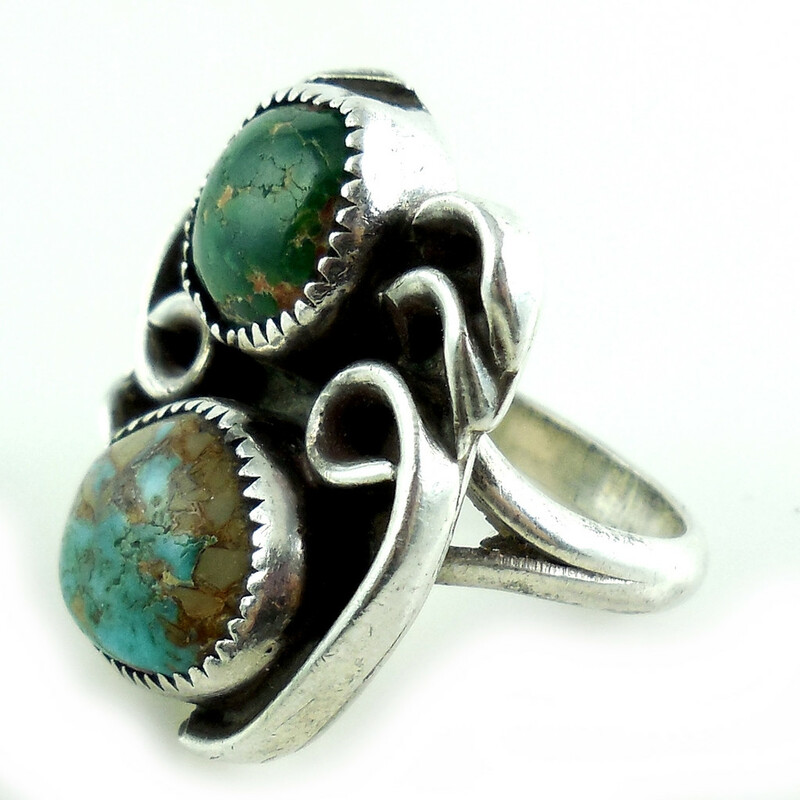 This is a large, vintage, hand made Native American sterling silver and natural mined turquoise (green and aqua) ring. Tested and Guaranteed to be solid sterling silver. Ring size is 7.25. 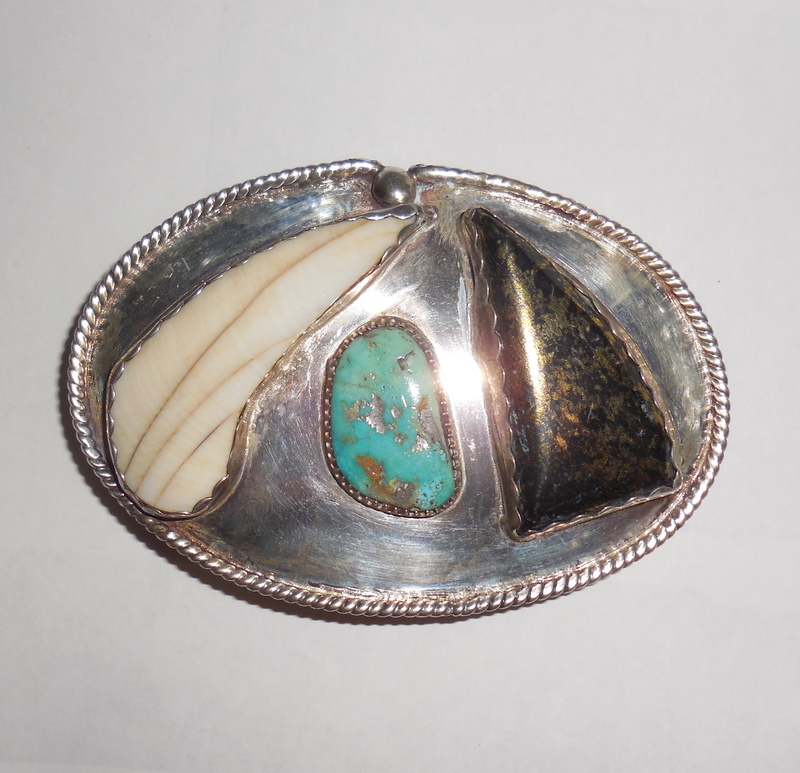 The turquoise stones are 9mm and 14mm respectively. Size of the top is just about 1 1/8" tall North to South. It has fine quality hand crafting with thick solid sterling silver. Very strong and well made. 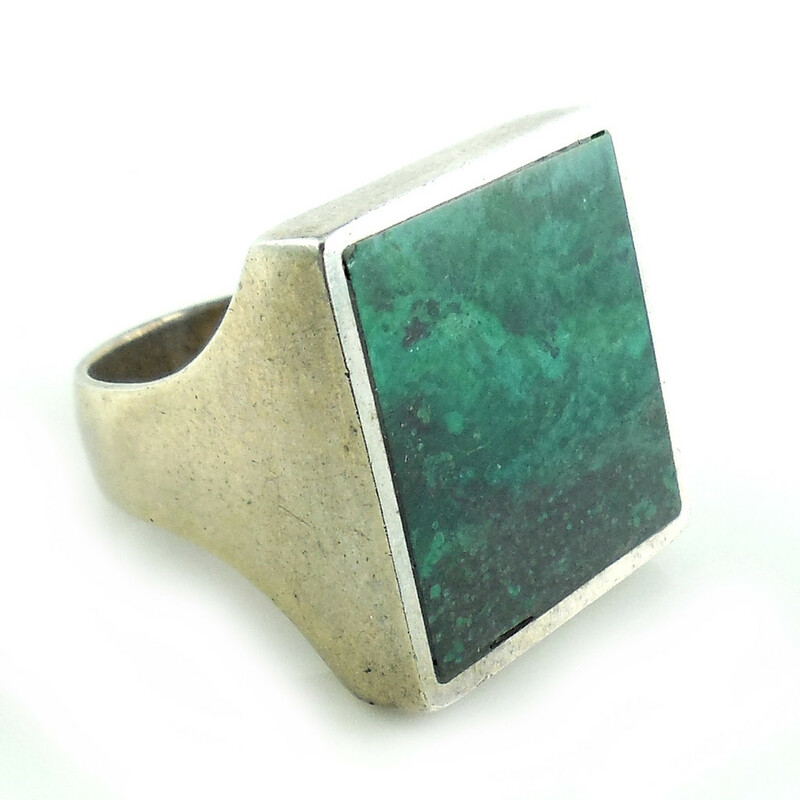 The turquoise has deep, rich colors with lots of natural graining. 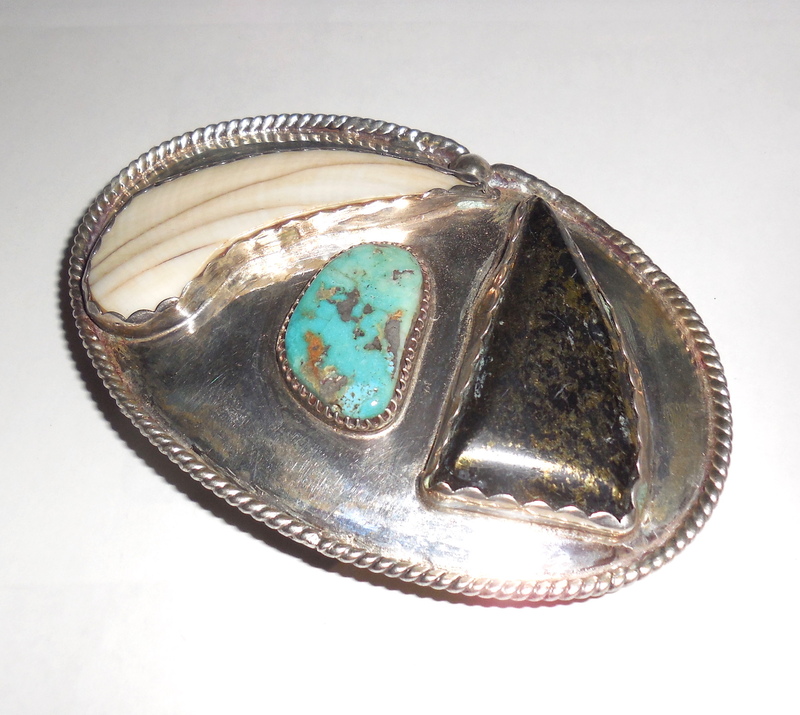 This is a beautiful large showy vintage statement ring for your Native American jewelry collection. 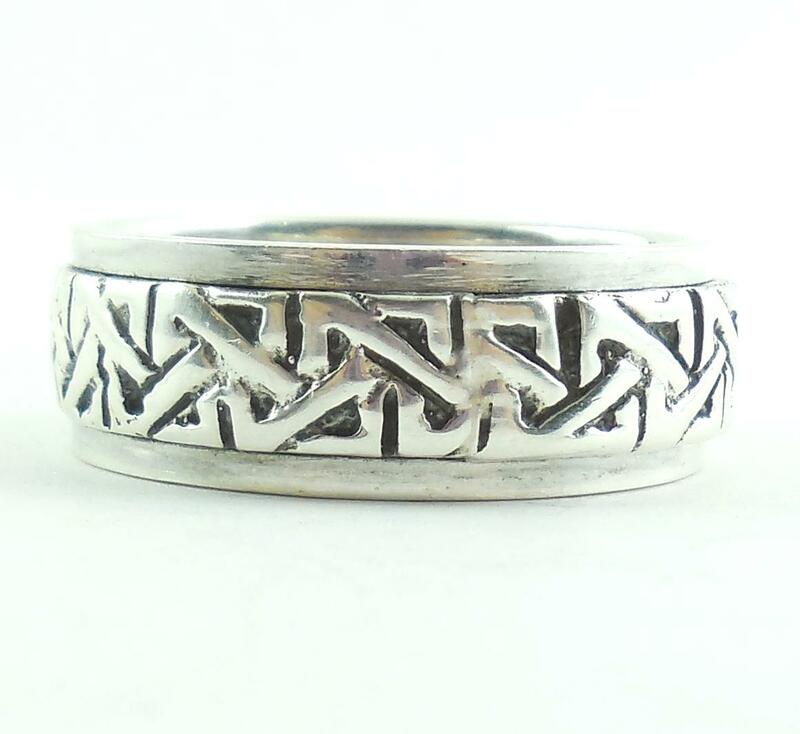 This is a vintage hand cut sterling silver mens Celtic Knot ring with an oxidized finish in excellent condition. Marked 925, tested and Guaranteed to be solid sterling silver. Ring size is 11 1/2. Weight is 11.6 grams. The sterling silver is thick and substantial. The pattern is strong and deeply recessed. Width is just over 5/16" wide across. 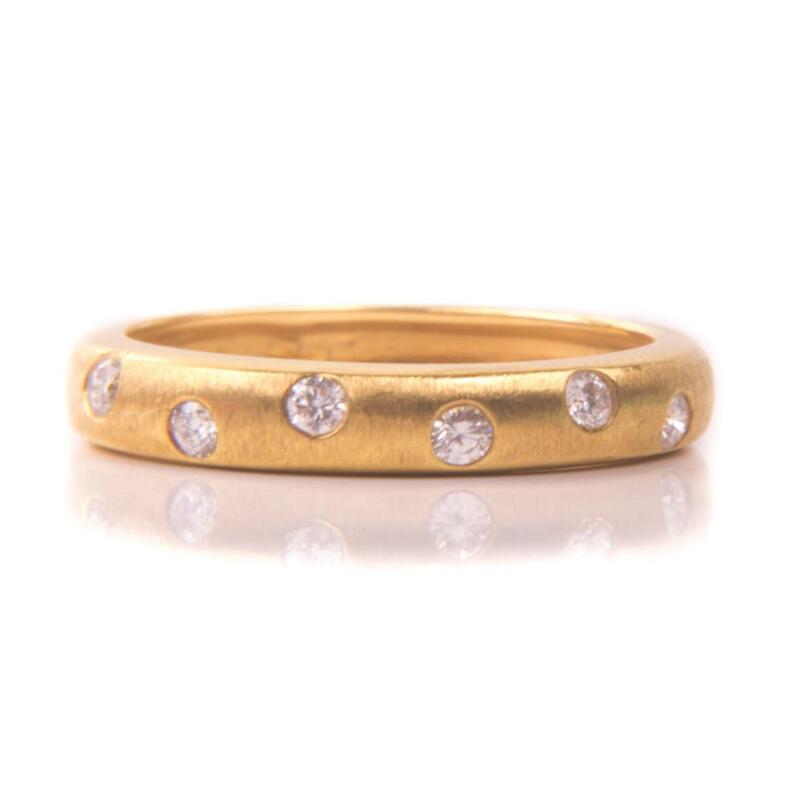 This is a beautiful vintage ring for your collection. It is very well made.